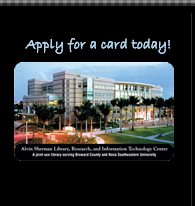 Explore October's many programs and events at NSU's Alvin Sherman Library. 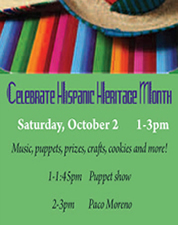 Check out Hispanic Heritage Month activities at the library and in the NSU community. Click here to find out a listing of programs and events . Don't forget about the James Hoban and Presidential Letters exhibits or our semi-annual book sale. Please make sure you complete the satisfaction survey below. It takes only a few minutes. Your input helps us better meet your needs. Thank you and enjoy October at the Library! In honor of Hispanic Heritage month the Alvin Sherman Library is featuring Informe Revistas en Espanol - Gale Cengage Learning. This database contains full-text Spanish-language Hispanic journals, magazines, newspapers, and pamphlets covering academic news, and general interest topics. Referred to as Informe Academico in Latin America. Interested in fun kooky stuff? Check out Pop Culture Universe. You can also check out ABC-Clio Database for information on different cultures. Sharkey’s Reading Club is designed to encourage early literacy and a love of reading. 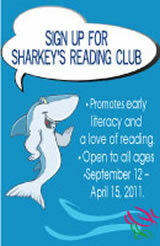 Sharkey’s Reading Club runs from September 12, 2010 – April 15, 2011. 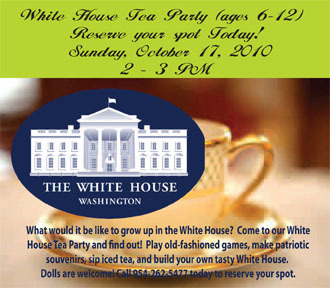 It is open to all ages, but especially encouraged for preschoolers. 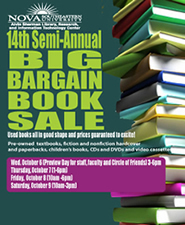 Starting October 1st, 2010, pick up a prize for reading at the Public Library Services Reference Desk. Don't forget to bring your reading log and membership card! Stories, songs, and a fun craft for children ages 3-5 years with caregiver. Develop the six skills your child needs to be ready to read. Explore the world online with kid-friendly sites recommended by the American Library Association’s Great Web Sites for Kids committee. Celebrate Great Book Week with Miss Meagan’s favorite books, songs and a fun craft! Check out Miss Meagan's favorite storytime selections! We're celebrating Hispanic Heritage Month with silly songs, stories and more! Check out Miss Meagan's favorite books for Hispanic Heritage Month! The Seals on the Bus by Lenny Hort and more great stories to share as a song. Find great stories to share as a song. 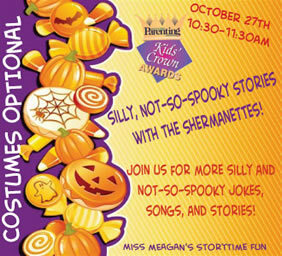 October 27: Silly, Not -So-Spooky Stories with the Shermanettes! Miss Meagan & Miss Rebecca share their favorite silly, not so spooky stories. Find funny, friendly, not too frightening Halloween books! Inspire your future reader at our Tiny Tot's Storytime! Join us for stories & songs selected just for children ages 6-36 months old. Celebrate Great Books Week with some of Miss Meagan's favorite books! Speak Spanish like your favorite animal: the dog says “guau, guau”, the cat says “miau, miau” and the little chickens say “pio, pio pio”! Check out bilingual books for children! Join us for stories & songs. Check out great books you can sing! It's pumpkin time! Join us for a reading of Pumpkin Eye by Denise Fleming. Also, check out fantastic books for fall! ¡Canta, baila, y ríe en la biblioteca! Después de la hora de cuentos, aprende cómo ayudar a tu hijo a ser un buen lector en la Universidad de la Lectura Familiar. ¡Se servirán galletas! Sing, dance, and laugh in the library! After storytime, learn how to help your child become a good reader at Family Literacy University. October 28: El día de los muertos Make your own skeleton mask! Tell us a book that you think has beat and receive a free pair of ear buds (while supplies last) at the PLS Desk. Does it have rhythm? Is it about music? Does the main character beat the competition? Be creative- any type of book with “beat” will count! Come discuss your favorite shōnen and shōjo with beat in honor of Teen Read Week! Marked A House of Night Novel by P.C. Cast. For current TAB Members, Teen Room Hosts, and interested Teen Volunteers. Come discuss plans for our upcoming teen events! New to TAB? Train to become a Teen Room Host! When you think Poe, do you tend to think about stories that are eerie, haunting, and romantic? Believe it or not, much of Poe’s work can be very romantic! Come discuss Great Tales and Poems of Edgar Allan Poe in honor of this year’s The Big Read. End Teen Read Week: Books with Beat on a great note with a Wii Karaoke Revolution night! Think you have what it takes to be the next Alvin-Sherman Idol? Our TAB judges we’ll see about that! 2:30-4pm The Last Frontier in America, presented by the Genealogical Society of Broward County. Valerie Kooyker, docent and speaker at the Fort Lauderdale History Center will look at the history of Fort Lauderdale. This film depicts the historical attack at the Jewish institution AMIA in Buenos Aires and the challenges of a handicapped young girl. Directed by Marcos Carnivale. This film does not contain English subtitles. Anita. Film sobre el ataque a la institución judía AMIA y los problemas de una adolescente discapacitada. Dirección: Marcos Carnivale. Introductory comments by actress and journalist Adriana Bianco. Justin Moss, Director for Public Relations and Community Affairs for the Florida Grand Opera, will share the Italian tradition of Grand Opera through Puccini’s “Turandot.” Join us for an afternoon of opera at its best! Learn about services, resources, products and information for persons of all ages with various disabilities! This South Florida event is FREE and open to the public! Enter the powerful world of literature and celebrate the poetry of Edgar Allen Poe. Guest speaker Christine Jackson, NSU professor, poetess and author, will read poems by Edgar Allan Poe as guests take in high tea. Supported by National Endowment for the Arts, The Big Read is an endeavor which encourages communities across the nation to read, discuss and celebrate American books and writers. Free and open to the NSU community and public. Click here to register. Celebrate National Novel Writing Month by writing a 175 page (50,000-word) novel by midnight, November 30th. Learn tips on how to reach your goal from guest speaker Dr. Andrea Shaw, author and NSU writing professor. Click here to register. This computer class is for absolute beginners who would like to learn basic computer skills in a comfortable and welcoming atmosphere. Class size is limited, reserve your spot today! Click here to register. Computer Camp: Look it up! 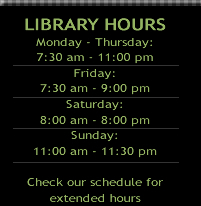 Learn how to access your library account from home, renew your materials, search the library online catalog, and find your next good read. Prerequisite: Basic computer skills. Click here to register. Spreadsheets for the first-time user. Page setup, column customization and basic formulas. Prerequisite: Basic computer skills.